Video footage posted on YouTube.com showing a police officer repeatedly striking a suspect in the face during an arrest three months ago has triggered an FBI investigation. The video shows two officers holding down William Cardenas, 24, on a Hollywood street as one punches him several times in the face before they are able to handcuff him. The struggling suspect yells repeatedly "I can't breathe!" The footage, shot by an area resident, came to the FBI's attention Thursday, prompting investigators to open a civil rights inquiry into the Aug. 11 incident, agency spokeswoman Laura Eimiller said. A Superior Court commissioner who viewed the video nearly two months ago and heard the officers' testimony has already found that their conduct was "more than reasonable" under the circumstances because Cardenas was resisting, the Los Angeles Times reported Friday. The police department has begun its own criminal and administrative investigations into the officers' use of force, said police spokesman Lt. Paul Vernon. The officers were identified as Alexander Schlegel and Patrick Farrell. Both have been reassigned to administrative work. "There's no denying that the video is disturbing," Chief William Bratton said at a news conference. "But as to whether the actions of the officers were appropriate in light of what they were experiencing and the totality of the circumstances is what the investigation will determine." Vernon said Cardenas is a known gang member who had been wanted on a felony warrant for receiving stolen property. In an arrest report obtained by The Associated Press, the officers said they tried to arrest Cardenas as he and two others were drinking beer on a sidewalk. 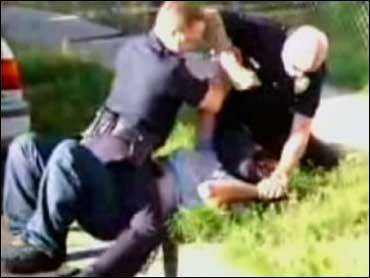 Cardenas ran and the officers caught up to him, tripped him and swarmed over him to apply handcuffs, the report said. Watch footage of the LAPD arrest. The officers described repeated blows to the suspect's face in the report, as well as his efforts to resist, and their concern that he might grab one of their guns during the brawl. "The suspect's hand covered my partner's gun holster so I yelled at my partner to watch his gun. My partner responded by capping his gun and delivering a left elbow to the suspect's face causing the suspect to let go of him," the report said. With Cardenas still resisting, one officer used pepper spray on him, but that had "little effect," the report said. The officers were only able to handcuff him after two of his friends arrived and told him to stop fighting, according to the report. Cardenas suffered cuts and bruises on his arms, leg and face, and received stitches on an eyelid. His attorney, B. Kwaku Duren, accused the officers of violating his client's civil rights and claimed department investigators were stalling. "I think the LAPD is being caught covering up an obvious excessive use of force," he said. Cardenas, who was held without bail, faces charges of resisting arrest. Authorities learned of the video footage when the defense made it public Sept. 14 during Cardenas' preliminary hearing, police said. The district attorney's office will decide whether to continue with the case, which is scheduled for trial Nov. 20, said spokeswoman Jane Robison.